Often called a stiff or “frozen shoulder,” adhesive capsulitis occurs in about 2% to 5% of the general population. It affects women more than men and typically occurs in people who are over the age of 45. 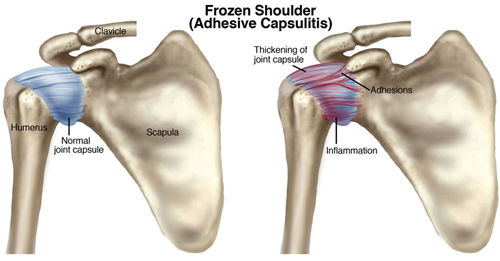 Of the people who have had adhesive capsulitis in one shoulder, 20% to 30% will get it in the other shoulder. What is Frozen Shoulder (Adhesive Capsulitis)? Often, however, there is no known reason why adhesive capsulitis starts. During this stage, it may be difficult to identify your problem as adhesive capsulitis. You’ve had symptoms for 1 to 3 months, and they’re getting worse. There is pain with active movement and passive motion (movements that a physical therapist does for you). The shoulder usually aches when you’re not using it, but pain increases and becomes “sharp” with movement. You’ll have a mild reduction in motion during this period, and you’ll protect the shoulder by using it less. The movement loss is most noticeable in “external rotation” (this is when you rotate your arm away from your body), but you might start to lose motion when you raise your arm (called “flexion and abduction”)or reach behind your back (called “internal rotation”). You’ll have pain during the day and at night. By this stage, you’ve had symptoms for 3 to 9 months, most likely with a progressive loss of shoulder movement and an increase in pain (especially at night). The shoulder still has some range of movement, but this is limited by both pain and stiffness. Your symptoms have persisted for 9 to 14 months, and you have greatly decreased range of shoulder movement. During the early part of this stage, there is still a substantial amount of pain. Toward the end of this stage, however, pain decreases, with the pain usually occurring only when you move your shoulder as far you can move it. You’ve had symptoms for 12 to 15 months, and there is a big decrease in pain, especially at night. You still have a limited range of movement, but your ability to complete your daily activities involving overhead motion is improving at a rapid rate. In response to a growing opioid epidemic, the CDC released opioid prescription guidelines in March 2016. The guidelines recognize that prescription opioids are appropriate in certain cases, including cancer treatment, palliative care, and end-of-life care, and also in certain acute care situations, if properly dosed. But for other pain management, the CDC recommends nonopioid approaches including physical therapy. Before you agree to a prescription for opioids, consult with a physical therapist to discuss options for nonopioid treatment. “Given the substantial evidence gaps on opioids, uncertain benefits of long-term use and potential for serious harm, patient education and discussion before starting opioid therapy are critical so that patient preferences and values can be understood and used to inform clinical decisions,” the CDC states. Physical therapists can play a valuable role in the patient education process, including setting realistic expectations for recovery with or without opioids. 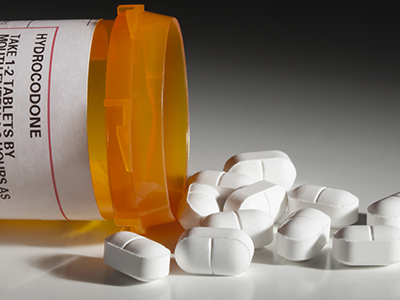 The American Physical Therapy Association launched a national campaign to raise awareness about the risks of opioids and the safe alternative of physical therapy for long-term pain management. Learn more at our #ChoosePT page.